This year the iPhone will be ten years old. As a creator and publisher at VanDam of mostly physical maps, I think a lot about how mobile technology and its major location services—Google, Apple and OSM—have changed our relationship to geography, our understanding of cities and countries, our sense and memory of place, but also our wanderlust and curiosity about the world. Cartography has always been about power, politics or propaganda in that it promotes one map point of view over another. For many years of 20th century physical map-making in the US, the road map dominated cartography. Sponsored by oil and car companies they had one purpose—to encourage automobile travel on American highways. Remember all those state and regional maps in every gas station? Enter GIS—first developed by the Canadian government in the 60s to map land use and store, analyze and manipulate data about soils, agriculture, recreation and forestry. It is all about data sets digitally overlaying maps. With the explosion of computer coding and the internet GIS leapt into use in every classroom, boardroom, office and police station. Then came GPS—a global space based navigation satellite system that provides location and time information. It was developed by the U.S. military and one of its first uses was to invade Iraq after nightfall. During the first decade of the 21st Century, smartphones—utilizing both of these systems—became our primary tool for navigation. But while the technological leap to digital and mobile has added more navigational flexibility and more precision of location, they cannot do what physical maps have always done—provide context. The smartphone map may put the user in the center of the map. I like to think the physical map provides God’s perspective. The big picture. The feedback we receive from travelers who treasure physical maps is that they are hungry for context in order to make sense of complex urban systems, to discover connections and relationships of place. We like to think that the expanded print view of our physical city maps provides entry into the underlying plan, revealing not only the joints but the bones and nervous systems of each city—from the Commissioners’ Plan for Manhattan or Haussmann’s grand Parisian Boulevards to Cerdà’s L’Example plan for Barcelona or the sublime design of Beijing’s Forbidden City to name but a few. Great cartographic designers employ the art of ellipsis, of knowing what not to show, thereby structuring meaning as much by what is left out as by what’s included. 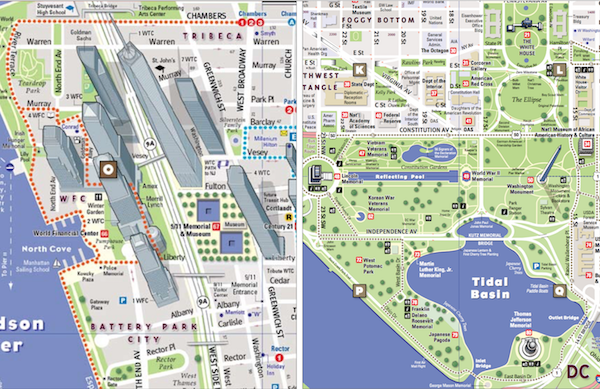 A successful map works like a fine poem allowing users to read between the lines. Any place can be mapped in infinite ways. Physical printed maps can be voluptuous objects of information design beyond finding where to go for brunch. Paper, folding, typography, color and scale conspire to create cartographic art with a unique take on each place. Even with consistent style sheets no two cities in print ever look alike. Google maps all look the same. While smartphone maps are perfect for directions and live updates they may be the enemy of wonder and memory. An older generation of drivers have for several years complained that GPS in cars eliminates getting lost—one of the pleasures of travel on vacations. To use a physical map requires greater engagement than the smartphone. GPS makes us lazy. We no longer negotiate with other people in the car about routes and landmarks. GPS eliminates serendipity. We second that last point at VanDam. While ground proofing our maps to Cuba and Havana, for example, we found major errors in the Google map. But it’s the lack of beauty that bothers us, too, about Google and other digital maps. They are cluttered and provide too much information. It is as if the graphics were created by a machine in a factory. The sameness of every place can lead to boredom. There is a generation of travelers who have never experienced a beautifully and thoughtfully designed map. Instead they often say, “Oh we downloaded a map and printed it out for our travels.” Take a look at that map and tell me how it affected your experience as an explorer of cities. And did you keep it? A richly designed physical map becomes a tangible record of exploration, time, discovery and beauty. Proof you’ve been there. * I like to think I design and publish the most gorgeous maps to international cities with new 2017 editions to NYC, London, Paris, Washington DC, Havana, to name a few. 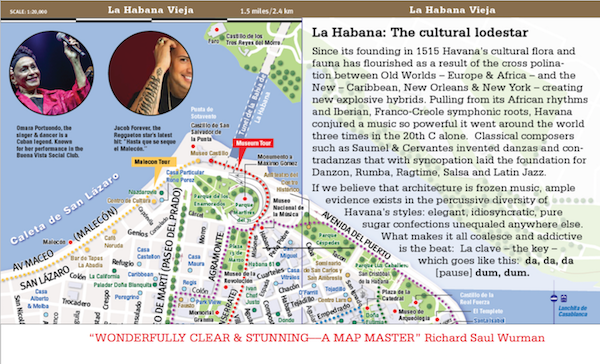 We also recently published a provocative map to the Nature of Cuba. © 2017 VanDam Blog. All Rights Reserved.